Event-based trading involves trading based on market events and announcements that can create movements in a stock price. Volatility tends to increase during these times, so traders have a better opportunity to generate higher trading profits. Even after the event occurs, residual volatility can remain for days following the event. 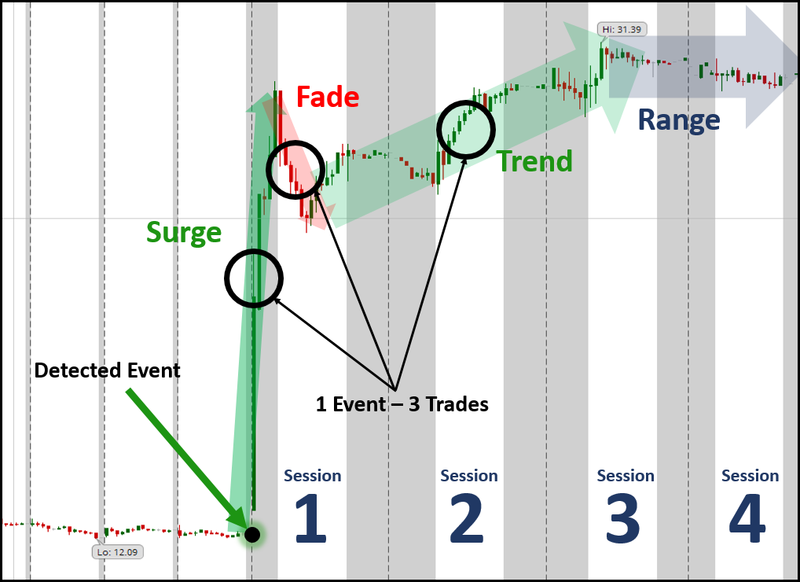 Traders need to identify the event (usually through a day trading signal service), decide on the most likely direction of movement, and establish a trading strategy based on this information. Although some investors avoid event-based trading because they believe it is too risky and unpredictable, the reality is that there is generally a predictable reaction to market events if you know what to look for. It is also a common misconception that you can only make money with event-based trading if you are able to make a trade within seconds of the event. This is simply not the case. In reality, there is limited liquidity during this initial price pop because there is an overflow of trades in one direction. What most people don’t realize is that the best opportunity to make money comes after this initial price pop. Since volatility around an event often continues for multiple trading sessions, there are additional opportunities for profitable trades in the sessions that follow. How can I profit from event-based trading? There are three main ways that investors can use event-based trading to make extra profit. Here is an overview of each of these three moves and how you can add them into your trading strategy. This is the initial run up when the news hits the wire. This initial pop is generally very fast and often happens in after market trading hours which makes it the most difficult to play. If you are a trader that is glued to your screen and ready to place a trade in seconds, you can use the trading signals from Sonal to play this initial pop. In this case you would set your preferences to text message or email delivery. Most of our subscribers, however, don’t try to play the speed game and focus on the second and third moves as described next. The second move is the fade which is a very popular trade among event-based traders and Sonal subscribers. Most events end up getting overbought, especially when the announcement occurs outside normal trading hours. The number of people trying to capitalize on trading the initial pop means that the market tends to overshoot an appropriate price response to the news event. As a result, there tends to be a pullback in price that follows the initial pop. Playing the fade is a trading strategy in which you use a bearish to benefit from this pullback in price. For example, you might short the stock or buy a put option on the stock either at the market open or in the hours after the initial event. Although every event is different, there is usually a fade associated with any major market event. Sonal subscribers get information on market events with enough time to place a trade on the market fade. Over the next few trading sessions, the stock price will experience a trend effect due to traders, analysts, and other investors hearing the news and placing trades. Sonal subscribers benefit by getting the news about the event before this crowd of traders. Placing a trade early means earning a higher return as the stock price rises on the trend. For example, in the case of an acquisition where the purchase price is explicitly stated in the offer, the stock often jumps and settles just below the offer price. In these cases, the volatility is priced into the options chain and presents an opportunity for an income-generating iron condor or M&A Arbitrage strategy. Institutional traders and hedge funds are able to trade events very successfully, and they are able to do so because they have access to sophisticated systems that detect these events at their origin and deliver only the relevant events as they happen. Sonal provides the same trading signals viewed by institutional traders and is offered to our subscribers so they have the same advantage as the professionals. To see the latest weekly webinar, you can visit our Live Webinar page. Let us send you a summary of the signals Sonal generates EVERY WEEK… and you can decide if you’re missing anything.